By 2006 this initiative had utterly outgrown the abilities of any one person. When one person’s passion and giftedness is tapped in their volunteer work, the serving is a joy and by 2006 a new era of volunteer delegation and cooperation lay ahead. ‘The early years’ proved that in Dufferin, a few determined parents and educators had a chance so see ‘if we build it, they will come’. The ideas worked and educators began to sense what could be shared and celebrated. Getting the story out there to other communities in Ontario like our own was a possible next step but how could it be done? Noelle Klassen, one of the DYFA coordinators, put us on the World Wide Web. She offered a week of her summer to design a DYFA website that would tell our story there and streamline registration by offering it, on line. Check it out! www.dyfa.com. Send along your feedback! In Public Spaces in Local Places , Maxine Greene argues that efforts need to be made to encourage public spaces where individuals recognize the integrity of diverse perspectives and each other’s stories. If these spaces can be realized, they will embrace imagination. Greene contends that the arts will be present in those spaces. “To be literate in this fashion, is to be able to crack the cues that have kept secret . . . freedom and fulfillment that allow created worlds such as Cézanne landscape. . . to emerge in experience, recognized, intended, deeply grasped.’ She concludes that something vital and palpable enters the human world through art. In this regard, through aesthetic experience, she sees the world as changed. Encouraging the arts rereleases our imagination within a dialogical community, allowing us to ponder about the future of our schools and to explore the spaces where emerging conversations can take place. (Greene, 2000)..
Why do teachers bring their classes to the DYFA? Why did every secondary school host and perform at the DFYA 2008? Is there somehow a growing awareness that this is truly worth our time? Our stories – each is unique and valuable. Just a look at Thursday and Friday’s programme and see the names of heroes in this county. Matthew Fleming – persuasion extraordinaire who led after hours workshops for teachers from several schools. Tony Culp who coordinated 4 four arts emphasis from ODSS. Mrs. Norgaard at ST Benedict who simply asks how she can help. Glyn Lloyd who brings Robert F Hall’s band because it’s wroth his time. Ann McAlpine who volunteered to come back to the school she retired from in January to conduct the school choir. Mrs. N. McClellan who marks the festival as the highlight on her arts curriculum. Mrs. Orme and Mrs. Heimbecker who train some of the most appreciative and determined students in this county. Brett Girvin and Erin DHS who are legends concerning secondary school enthusiasm and commitment. Ryan Grist who was led the ODSS Jazz band for about then years, even as a student when no teacher could! Each and every name in the program for all the days of the week – all people in our education community who has served in ways none of us can forget. Precedents set in 2008. An emphasis on Music Monday through the determination of Mary Runciman. A fifth morning and several schools attending a second time in order that audience numbers were evenly distributed for all performances. Students spoke as part of the introductory remarks alongside their teachers or principals. Bernadette Hardaker and David Nar co hosted on the final morning and we all had so much fun they decided to come back in 2009 as co host for each and every day! We distributed our first professional press reassess based on the excellent advise of Leisa Wray who was covering publicity for Theatre Orangeville that spring. Students from Mono & Amaranth wrote over 60 notes that were briefed and sent to attending teachers and sensors with our thanks for commitment. Our story in 2009 begins in a personal context and I write, as a DFYA coordinator, aware of my privilege to have spent the last year reflecting on some of most distinguished voices in the education community and arts advocacy. Overall, educators who attend remind me of what Richmond (1993) outlines as teachers who embrace the six criteria of Imaginative Art Teaching (I A T). 1) IAT generates unusual ideas and activities: The public, private and separate school teachers who attend cooperate in ways unheard of anywhere else in terms of performance and visual arts display. To the best of our knowledge, it is unique provincially, nationally and internationally. 2) IAT constructs learning opportunities that lead to worthwhile artistic understanding: in fact some teachers consider the experience the impetus and highlight of their art curriculum. 3) IAT utilizes the teacher’s knowledge and judgment: participation requires no privileged arts background or experience and is based on voluntarily sharing school based arts ideas amongst the education community at large. 4) IAT is flexible and adaptive to the unique demands of practice: the festival addresses the actual learning community in the county and involves teacher’s feedback. 5) IAT respects the exploratory, open ended and insightful nature of arts: the DFYA offers material and opinions from committed educators and publishes reflections on what was experienced. 6) IAT is vital and motivating and is a model for the pupils’ own imaginative efforts in art: ideas as vignettes. Letters and drawings from students themselves sent to the DYFA speak clearly about this. In ‘The Heart of a Teacher’ Parker Palmer speaks of teachers meeting as fellow travelers offering encouragement to each other in this demanding but deeply rewarding journey across the inner landscape of education. Often schooling highlights how different one learning style is from another. How different a person’s background and life experience can prepare them for graded activities in communication, mathematical skills, and sports ability. Yet this celebration transcends levels and invites each performer and audience member into the aesthetic moment. No child interviewed about their festival experiences spoke of being teased, bored, and feeling isolated or not valued for each and every performance given. And I have read nothing closer in part to the set of foundational beliefs of the celebration’s volunteers and teachers that the words by Karen Witmer as she speaks of ‘Transformative Leadership’. 1) I believe in the dignity of all individuals. I believe we are all different and that it is those differences that enrich our society and our learning. I believe it is no job as an educator, a parent, and a human being to help each individual learn to see her differences as gifts to be discovered and nurtured. 2) I believe in the power of learning. In fact, I believe learning is power and freedom. Since I have such confidence in the power of learning, I believe nothing is truly impossible. The only constant in life is change, and change is only possible through learning. 3) I believe in the power of relationships. I believer people need to be connected in order to grow. I believe we learn best when we learn together. I believe we are more likely to take risks when we have the security of relationships to comfort and encourage us. 4) I believe in love. Love is the greatest of all emotions. It should be the reason behind every great deed. The force behind every good decision, and the influence behind every major movement. My leadership, my decision, and my learning are all based o love. These beliefs have given me much to reflect on. They inform my conviction that case study about the DFYA explores a phenomenon that a model for other communities. Ideas brought up first in 1998 at a community forum that brain stormed opinions from each and every sector in the Dufferin community. Henderson and Hawthorne (1999) views transformative curriculum leadership as “a fancy term used to describe life in a democratic society – a life in which we work together, learn together, and grow together towards a better way. We, as ‘becoming’ leaders, must listen with our hearts, speak of truth and love, and envision what’s right. As difficult and draining as it is transformative curriculum leadership is our calling. And we wouldn’t have it any other way.’ Yet, words and talk are one thing. Persistence and commitment is another. Several of the arts advocates and teachers who attended the first festival is 1998, had continued to attend and their names were on the 2009 programme: Mrs. Karen Orme, Mrs. L. Heimbecker,, John McIntyre, Mrs. Chris Langman, Mary Runciman, Marilyn Logan, Joy Bell, Linda Thompson, Melissa Dobson, Brandy Robinson, and Ann McAlpine. All of us as children and adults are impacted by our social, political and economic contexts. Through out our lives we construct lenses through which we view the world. In the forward of Context, Content, and Community in Art Education – Beyond Postmodernism, Jerome J. Hausman observes: ‘Increasingly, we are coming to recognize the interconnectedness of elements that contribute to the fabric of our existence. Our expanded visions of arts education are bringing us back to an enriched grasp of self‐ knowledge and creative process. Ideas of a ‘global village’ are bringing us to a deepened sense for community. The story documented on www.dyfa.ca is about relationships happening among remarkable people who imagined something beyond any one circle of influence. Something greater than the sum of parts. With great pride in my community I mention the names of the people who have linked arms as they have served in the DYFA 2009. Mr. Wayne White, Ms. Christy Balch, Mr.Cliff Wright, Ms. Hannah Campbell, Mr. Willie Brown, Mrs. Bridget Burd, Mr. David Kirk, P. Forrest. Vision. Affirmation. All Inclusive. Community Voice. Partnership. Connection. Dynamic Purpose. DYFA 2005 Noelle Klassen is a member of the Orangeville Baptist Church, mother of 3 students at Credit Meadows Elementary School and arts advocate. As a web designer, she imagined the impact of reducing paper chase by creating a web site for the DFYA so that registration and resources could be offered on line. Not only could schools send in their registration, they could also submit the visual arts registration forms, emcee info and stage management requests, on line. With passionate determination, Noelle took a week of her summer in 2004 to set up www.dyfa.com one summer and catapulted the DYFA over onto the word wide web. She also graciously agreed to lead the DYFA as one of the Co Coordinators for 2005. Our growth areas in community remain today as they were then – computer servers crash, e mail goes missing and not having a contact person/teacher/parent at times identified at each school is the ever present reality but the determination and patience involved in staying focused on what it takes to get the job done for children to celebrate the arts in this community makes the glitches worthwhile. And few volunteers have put their shoulder to the wheel like Noelle. She also introduced the festival to PowerPoint presentations and camera audience scans on the OCBC jumbotron, which to this day, are mentioned by the students as something they especially look forward to! Two more schools attend this year: St Andrews and St Peters! Robert F Hall band host! The programme reflects a few new contacts: Daniel St. Pierre, Walter Vander Vaart, Nancy McClellan, Sue Allen, Mary Roberts, Ms Armstrong, Leanne Truska, Kim Shillum, Cathy Rebhan, Lisa Knie, C. Kay, Carla Dziob-Smith, Lynda Hallran Thompson, Wayne Peeters and Michelle Davis. The DYFA 2006 . . . is dedicated to the arts (music and visual), education and children has brought us together each spring for the past 9 years to celebrate their vision. Students from every school in the county are invited to participate. In a non-competitive atmosphere children and teen come together with teachers and volunteers to share their voices . . . vocally, instrumentally and visually. It is a morning of community and connection for everyone who attends. A ‘potluck’ of talent from chimes, bells, ribbons, recorders and dance to choirs that have you holding your breath and bands that blow you away. Visually, students contribute art in every medium imaginable from sketches, paintings, and posters to poetry and prose, fabric arts, paper mache, and sculptures. It brings about the true meaning of ‘festival’ that goose bumpy feeling that comes from the joy of coming together, sharing and celebrating life. It creates memories that last forever. Unlike activities and celebrations of individual schools, the festival brings together kids who are usually unknown to each other – strangers- until that moment when we unite as one group to enjoy each others company. No one is marked or evaluated. There is little peer pressure. For that morning we are all family. Long hours of practice and dedication are acknowledged by the attention and applause of the audience. Everyone knows what it are like to e o not both sides of the stage. It is difficult to remember the first years of the festival. Like all best memories they are clouded with perfection. I know in my mind that each we have made lists, wrote reviews and had discussions on how to improve next year. Now that we do our best to follow through with those thoughts, but in my heart my memories remain. . the same. . ‘What a wonderful occasion. . . I’m so glad to be part of this . . .’Perhaps, selfishly because most of all I love to watch and listen to the kids. . So full of promise, excitement and energy. Personally, I’m not sure how the evolution of volunteer hostess to volunteer coordinator came about, but I see my role as a very small cog in the wheel – s so many people volunteer their time and expertise to organize the festival. I am happy to be the person who deals with the ‘days of’ to schedule and direct the hosts of the festival. To ensure that each school is welcomed and made to feel at home. To deal with those ‘immediate glitches’ that spring up and need to be dealt with – to see everyone out the door at the conclusion of our mornings knowing how much we enjoyed their contribution and how thankful we are that they joined us. 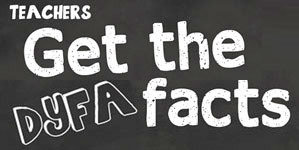 I thought that the DYFA was a great opportunity for different schools to come together to show what their school does. I thought the Orangeville Christian School band rocked. Especially the drummer! Our own choir did amazing. The DYFA is so cool. . . When we were watching other groups and the other schools I was wondering if they felt nervous or not. It was really cool and fun and I hope to go next year. . . When I was up on the stage I was frightened that I would mess up, but when I started singing I felt fine and it was so much fun. When the people were playing the drums it looked really fun so when I got to another grade at school to get drums myself I will try my hardest and have fun at the same time. I am going to join the choir next because I just like music. 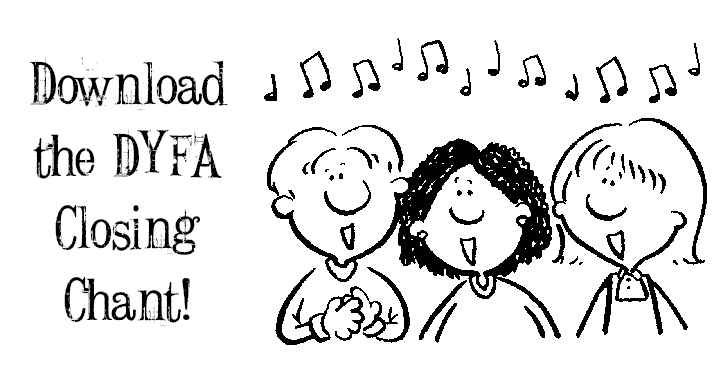 And the DYFA had lots of music . . . One song was very funny. . . I thought the DYFA was amazing! I really like how the Catholic school did really well with song by Green Day. Our school really did well too. Showcasing Curriculum related arts programs in Instrumental & Vocal music, Visual arts, Dance & Drama To attend, contact your local Dufferin elementary school. The enthusiastic feedback from students was unprecedented in scope. Never had we heard from so many! Never had so many sketches, impressions of special moments or notes of thanks been offered and none of this would have been possible without the leadership Dufferin’s educators like Ann McAlpine, Karen Orme, Laurie Heimbecker, Lisa Longstreet, Julie Woods, Kim Smith Brandy Robinson, Ami Alexander, Henry Lise, Leanne Truska E Taylor, Mary Runciman, Martha Muntz, B. Evans, Donna Norgaard, Linda Brown, S. Mille. Obviously, an attempt has been made to credit some of hundreds of people in Dufferin have contributed over the years. Any attempt though falls short of mentioning of everyone involved as no one can list or imagine the ultimate impact upon young people of an initiative of these proportions except to say that the initiative is unique and something every person in this community can be proud of. The journey ahead lies within community. Each year feedback is gathered on how we’ve done and what to envision for the journey ahead. Each fall we invite representatives from every school to attend a planning session and the presenters last October summarized the excitement that awaits us this May 2008 with a full five morning event for the very first time! Up to three thousand are expected to attend and DYFA registrar Elizabeth Campbell e mailed in the first week of April 2008 information on when a school’s performance time is slotted. Press and parents may register with their local school principal to attend as this is a school event, not a public venue and registered guests must sign in. Thanks goes out to principal Jim Bonter and ILPS on October 17th for hosting the DYFA all school planning session for the second year in a row. Among those who attended were Bruce Phillips, Marilyn Logan, Lynda Brown, Susan Allen, Kathy Wray, Melissa Dobson, Tony Culp, Kathy Ayliffe, Sharyn Ayliffe, Martha Muntz, Beth Ellis, Mary Runciman, Wendy Carter, Noelle Klassen, Jaime Wouters, Shirley Puchalski, Brett Girvin, Jan Helps, Kim Smith, Nancy McClellan, and Rosemary Fyfe. Brett Girvin, Music Department Teacher at Erin DHS spoke of Erin DHS’ first performance at the DYFA last May and remarked that his students were encouraged in their own arts interests through it and there is a post festival, positive enthusiasm this fall as well. He has offered to be the liaison with East Wellington Elementary Schools and may work with volunteer Hannah Campbell to connect with these new sister schools. His students have offered to produce the DVD highlights for 2008! Tony Culp and his students at ODSS may collaborate on this project as well and anyone interested in this awesome opportunity in working alongside secondary students in the production, editing, and copying of this project are welcome to contact either Brett or Tony. Joan Borden is happy to continue as the Dufferin Arts Council liaison and is responsible for the Artists in the Schools Programme and her budget includes DYFA funding. www.dufferinartscouncil.com. The Dufferin Arts Council offered to fund a digital pic/banner project of pics sent from every school that attended the 2007 Tenth Celebration and a special thanks goes out to each school that responded: Laurelwoods Trillium Montessori, MAPS, Orangeville Christian School, Mono & Amaranth, St Peter, Montgomery Village, Princess Margaret, St Benedict, Parkinson Cent, and Credit Meadows. Thanks go out to the volunteers/teachers who did a phone brigade about this project: Sue Buckle, Hannah Campbell, Mary Runciman and Ami Alexander. meaningful or give more energy to the DYFA, and the DYFA team is deeply grateful to the principals and teachers involved at Montgomery Village, Credit Meadows, Princess Margaret, St Benedict and Parkinson Centennial & Donna Norgaard, Martha Muntz, Laurie Heimbecker, Karen Orme, Susan Allen, Mrs. Miller and Kim Smith. Bruce Phillips brought along the 2007 DYFA DVD highlights he produced and distributed them at the meeting. The cover design is his work and copies will be sent to the schools along with session notes as a thank you to one and all who encourage this awesome initiative. For DYFA teachers and volunteers and those interested in their own copies contact@dyfa.com F Stop has come on board as a festival sponsor and we look forward to their support in 2008. Kathy Ayliffe began some 7 years ago to train and develop volunteers who facilitate ‘day of’ logistics for the schools so they feel welcomed and valued. She is one of Dufferin’s most dedicated volunteers and we are deeply grateful for her and her team: Bev Leggat, Elizabeth Campbell, Beth Belder, Shelley Roorda, Val Scorgie, Lyndsay Scorgie, Karen Child, Kathryn Matzov, Dianne Crawford, Carol Gregg, Brenda Davies, Debbie Hunt, Maryan Angus, and Sue Buckle. Kathy arranged to notify schools attending the DFYA of an opportunity for students to make birthday cards for a young cancer patient. The response was remarkable. Some French immersion students from our sister schools in East Wellington participated as well, and the cards collected were mailed priority post. “Twelve years ago a few interested community members started discussing the need for a forum to celebrate and promote the arts in Dufferin County. The discussions continued and eventually a non- competitive venue was created by community volunteers and sponsors, parents and school councils. Teachers and students were invited to participate in the first Dufferin Youth Festival of the Arts – a celebration of visual art, music, drama and dance at the Orangeville Baptist Church. From that point on the festival continued to grow – another morning was added, a mass choral piece was commissioned, corporate sponsorship occurred, details were refined, more schools participated, many community members attended. Now in its eleventh year, the festival continues to encourage and highlight the arts in our area. If you’re new to this festival – you’re in for quite a treat. The registration process through the website is easy. The coordinators and volunteers are encouraging and approachable and respond to questions through e-mail or phone. Noelle Klassen – DYFA 200 Co Coordinator and Web Site Designer projected the dyfa.com website on PowerPoint and walked us through the 2008 registration process with its three separate forms: school performance, visual arts and stage management. Noelle presented the new format of DYFA school performance pictures and the visual arts displays taken by volunteer Sharyn Ayliffe. Students have specifically written Sharyn about how they have appreciated her awesome DYFA photos. Elizabeth Campbell, who has served as our DYFA registrar and programme designer for two years, has agreed to continue in 2008, though she is currently at grad studies at U of T. Community thanks was given! She will confirm the itinerary according to opportunity and date of registration in the new year. If an elementary school is interested is a second separate performance day/opportunity at the DYFA – please contact info@dyfa.com by February of 2008 re: logistics. In March 2008 schools can send their emcee info along to emcee@dyfa.com. We are delighted to announce that David Nairn and Bernadette Hardaker will return in 2008 as festival emcees. Feedback from teachers suggested that emcees and coordinators address timing issues around a school using no more than 17 minutes total for their performance opportunity. We look forward to having secondary schools once again host each DYFA morning. Elementary school students have written that this is one of the only times they have a chance to hear what can be chosen as a secondary school arts elective in dance, drama, visual arts, band, and improv. “If you have any questions please email them to me at this address and I will do my best to answer them. The visual arts display is held in the chapel area of the Orangeville Baptist Church. The church will be open from 2:30 p.m. – 4:00 p.m. in the afternoon on Sunday April 29th and from 7:00 a.m. on Monday for setting up your displays. Displays must be free standing although there are some round tables available for use. Space is used up on a first-come first-served basis. When you arrive to set your displays up, simply locate a vacant area and go to it! The displays must be removed by Thursday, May 3 at noon. People view the displays during lunch and break times during the Festival. As with the performance arts, the visual arts portion is a non-competitive sharing of the arts. Teachers are encouraged to bring a mix of art from their schools from various grade levels. Labels as to the grade that created a type of work are interesting and helpful for teachers who are collecting new ideas to enhance their own art activities. Arts Matters in Dufferin is changing! We have provided a new online form to make it even easier for you to let us know about what your school is doing in the arts: artsmatters@dyfa.com. This year we have asked parents, as well as teachers, administrators and students to participate in Arts Matters. We have simplified the process for you this year by adding four simple questions that you can “click” and answer. Pick one or answer all four. This is your opportunity to brag about the great arts that are happening in your school community! The deadline for the first edition is November 28th. Check out the incentive being offered as a way to say “thanks” for promoting the arts in your school! Wendy Carter, DYFA Co Coordinator 2008, recommended her Western faculty advisor’s math scene web site for teachers intrigued by the idea that math+drama+music might compliment each other! See http://www.edu.uwo.ca/mathscene/. George Gadanidis will update our web site on his Math Performance Contest once he has it ready and this contest will start in Jan 2008 … here’s the link, but it’s not ready for the public yet … http://www.edu.uwo.ca/mpc/. Post script – Wendy Carter received a go ahead on Oct 30th from the UGDSB to conduct interviews with students and teachers on her graduate thesis topic “A Case Study of an Arts Education Experience – “Dufferin Youth Festival of the Arts” ”. “First, I want to thank you for all your support, passion and energy to make this event such a special event! To capture your theme- feel the beat, hear the beat, and the beat goes on! I always wonder what the next year will hold –what new ideas will be shared, what new people will be there, what organizational pieces have been added. Last year saw many new additions as this festival only continues to improve an already wonderful format – Five additional schools came on board whether as audience members or participants. The Band from Erin District High School in and the website became a great communication vehicle. This year, we are looking at 5 days – What does that say about participation!? Arts matters is a great forum for parents to highlight the arts in their schools, the DVD of 2007 and the photos taken provide further inspiration! The Festival of the Arts has become “our story” woven into the fabric of a culture in our schools. Thank you. To the master weavers, Wendy, Jaime and Noelle, thank you. .